Chicago Forrestville High School "Jaguars"
Forrestville High School was located on Chicago's South Side, near the Dan Ryan Expressway (Interstate 94) and south of the Chicago White Sox home parks, Comiskey Park and U.S. Cellular Field. 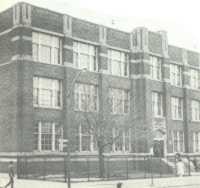 The opening of the school took place in the fall of 1964 to relieve overcrowding at Dunbar, DuSable, and Phillips High Schools nearby, but changed its name to King in 1971 in honor of the civil rights leader. The Jaguars in likelihood were members of the Chicago Public League and offered track along with football, basketball, and possibly baseball. More information is needed to complete the picture. Please see the bottom of this page for our addresses if you would like to contact us. According to the IHSA website, this is the only item that was found during our research. In the school's fifth year, a Forrestville student was able to qualify for the state meet and came home with a medal. Douglas Frederick was second in the long jump at the 1969 state meet held in Urbana-Champaign. "Forrestville football history is brief, but worthy of note is their 1968 season. That year Forrestville fielded their first varsity team. They were undefeated in the regular season going 7-0 and winning the Green South division of the Chicago Public League under coach Ken Sims. In the Blue-Green playoffs they were awarded a first round bye then beat Roosevelt 25-6 before losing in the semi-finals to a Marshall team that featured future NFL star Darryl Stingley. An impressive 8-1 record overall. They were moved up to the Blue division in 1969 and 1970 and had a tough time going 0-6 and 2-5, respectively. Their last game was a 8-6 win over Hyde Park." Barbara Sizemore -- As principal of Forrestville, she was the first African-American women to serve in that position at any Chicago high school, doing so until 1969. She also served as superintendent of schools in Washington, DC and later went onto become an professor at the University of Pittsburgh and DePaul University that worked with inner-city students. Charles Allen -- Mr. Allen arrived at Forrestville in the fall of 1964 and left his mark by giving the school its' colors and nickhame, which matched his alma mater, Grambling University. He served as the first coach in basketball and baseball, and helped lay the path for future King coaches Lonnie Williams and Landon (Sonny) Cox, plus taught physical education and driver's education at the school. "It is worth mentioning that Dr. Anderson Thompson was the assistant principal while Dr. Sizemore was principal."